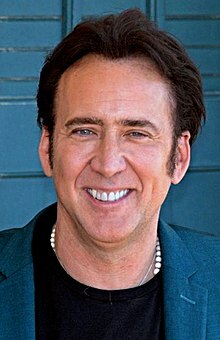 Nicolas Kim Coppola (born Januar 7, 1964), kent professionally as Nicolas Cage, is an American actor an producer. He haes performed in leadin roles in a variety o films, rangin frae romantic comedies an dramas tae science feection an action films. In the early years o his career, Cage starned in films such as Valley Girl (1983), Racing with the Moon (1984), Birdy (1984), Peggy Sue Got Married (1986), Raising Arizona (1987), Moonstruck (1987), Vampire's Kiss (1989), Wild at Heart (1990), Honeymoon in Vegas (1992), an Red Rock West (1993). This page wis last eeditit on 12 Juin 2017, at 12:04.